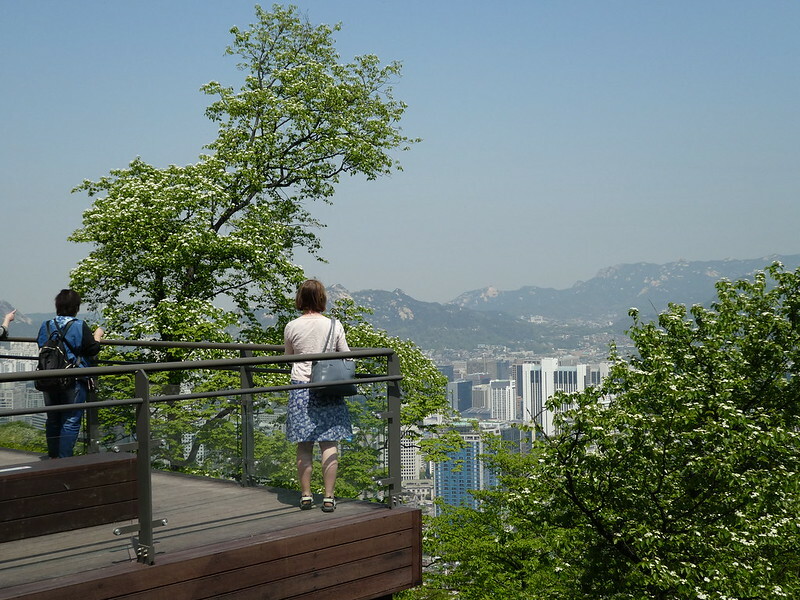 Yet another clear, sunny morning so we thought it was a good opportunity to go up Namsan mountain. We took the metro to Dongguk University station (Line 3, Exit 6) and transferred to one of the circular route buses which go up to the mountain summit (either Numbers 2, 3 or 5 from this stop). As our bus journey took place less than 30 minutes after we exited the metro it was considered a transfer and there was no additional charge to our T Money card. Buses terminate near the top and there was just a short, steep section to reach the Seoul Tower Plaza at the foot of the tower. 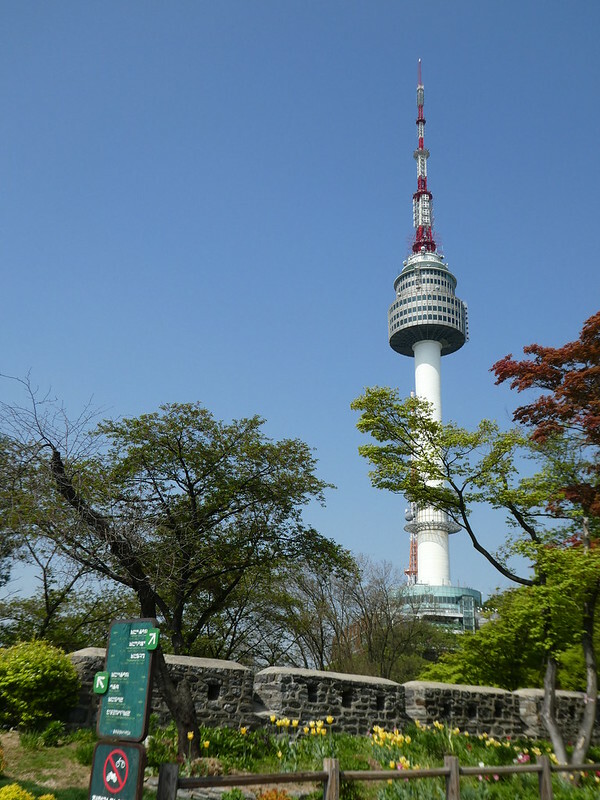 Namsan Seoul Tower stands 236.7 m tall (774 ft) making it one of the largest in Asia. The tower was constructed in 1969 as a radio and television broadcast tower but was later modified and opened to the public in 1990. 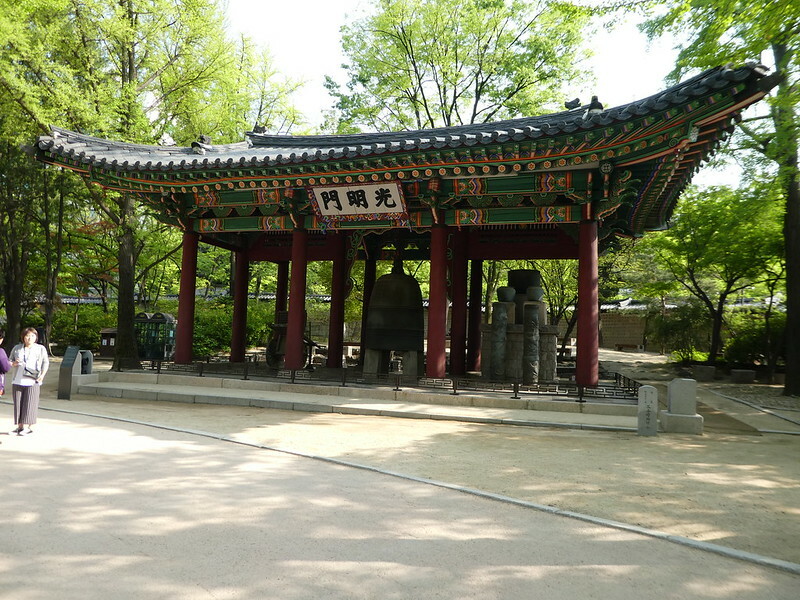 It can be seen from all parts of the city and has become a landmark of Seoul. We decided against buying tickets to ascend the tower as the Tower Plaza was in an elevated position and we were satisfied with the views from there. The Plaza is an attractive open space and has several wooden viewing decks leading from it. There are also several cafes and gift shops where I tried in vain to buy a postcard. I wanted to send a card to an elderly relative but these seem to be a thing of the past in Korea and I had no luck which was a shame. Returning downhill by bus we explored Jangchungdan Park which was looking delightful with its colourful display of flowers. A wedding photo shoot was taking place on a small bridge over the stream, a perfect backdrop to record the happy day. Lying next to the park on a steep hillside is Dongguk University so we climbed the hill to take a look around its campus. As with Yonsei and Ewha universities, which we had visited earlier in the week, Dongguk is located in a beautiful parkland setting. The university is based on Buddhism and was founded in 1906. It contains a temple and large bell which were both adorned with brightly coloured paper lanterns. It remains one of the few Buddhist affiliated universities in the world but also welcomes students and teaching staff from all faiths and philosophies. Wandering around the campus, which was devoid of activity on a Sunday morning we came across a charming small cafe for our morning cappuccinos. At first we were the only people there but we must have set a trend as others starting arriving soon afterwards. Leaving the university campus from a different exit, we headed down the hill towards Chungmuro metro station and noticed a signpost to the Namsan Hanok Village so decided to make a slight detour to take a look. 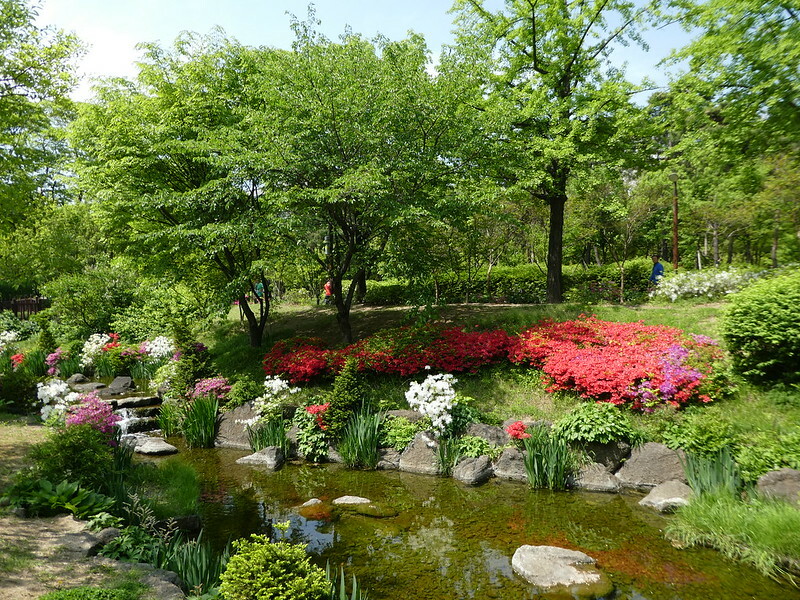 The village offers free admission and is set in landscaped gardens featuring a pavilion, festival stage and small lake, with the wooded backdrop of Namsan Mountain. Just as we were stepping inside the cluster of restored houses a 15 year old school boy, looking very smart in his blazer approached offering us a personal guided tour of the village. We jumped at the opportunity and enjoyed our guided tour looking around the five preserved Hanok houses. He explained that each of them had been re-modelled from the traditional houses of the Joseon Dynasty covering a wide range of social classes from peasants to aristocrats. The houses are furnished as they might have been at that time which helped us gain a better understanding of how people lived in those days. At the end of our tour we were invited to provide written feedback in his logbook and we thanked him for accompanying us through the village. 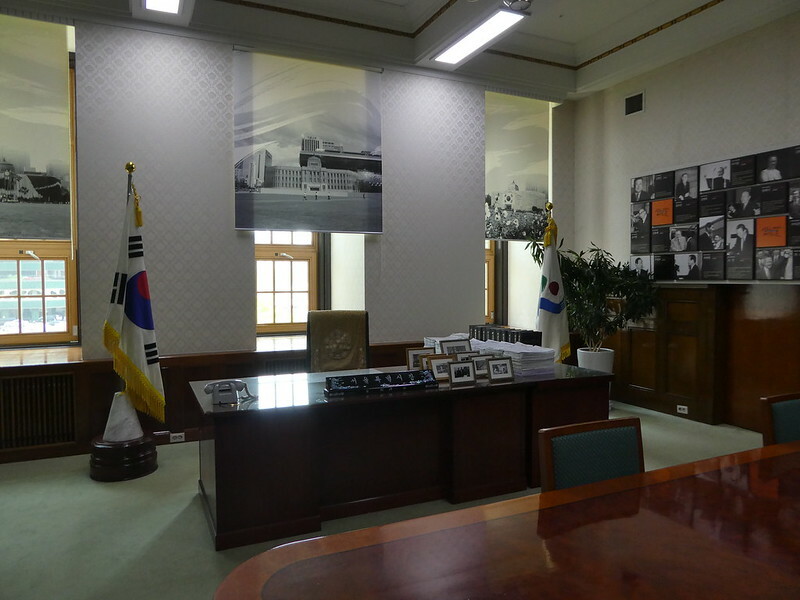 These free guided tours operate at weekends and are organised by the Youth Cultural Corps, a charitable youth organisation based in Seoul. We thought that these free tours were such a good idea as they not only benefit tourists but also help foreign language students gain confidence with language and social skills. 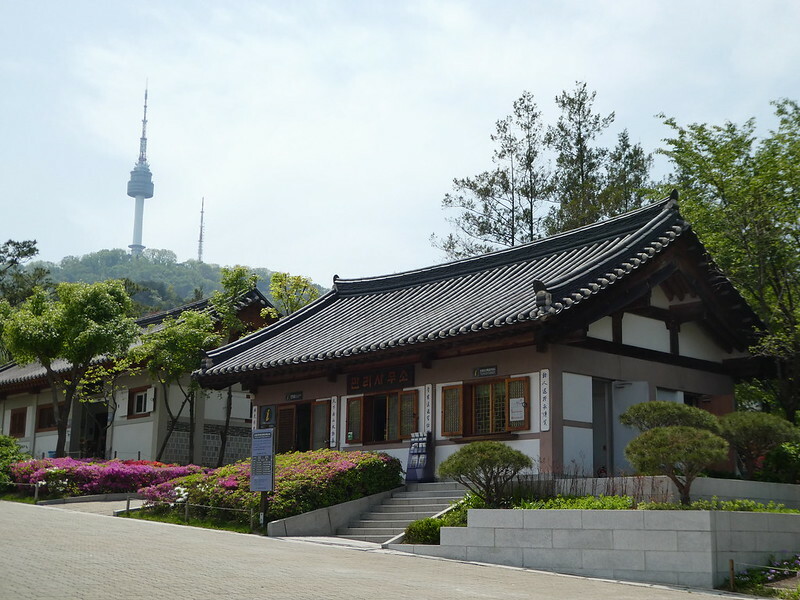 Located near to the Hanok Village is Korea House, a cultural centre which is normally open to the public but was closed on this occasion as a society wedding was taking place there. 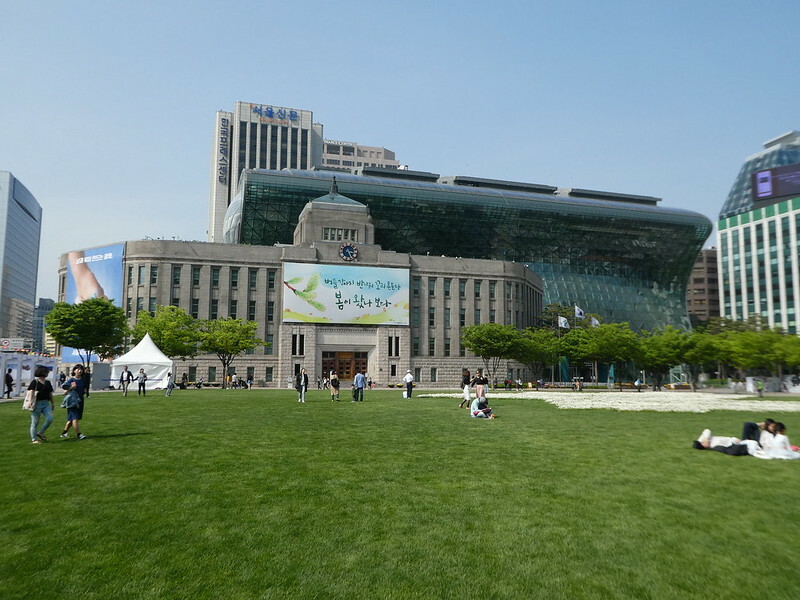 Returning to our original plans, we took the metro from Chungmuro station to City Hall so that we could take a look inside Seoul Metropolitan Library. 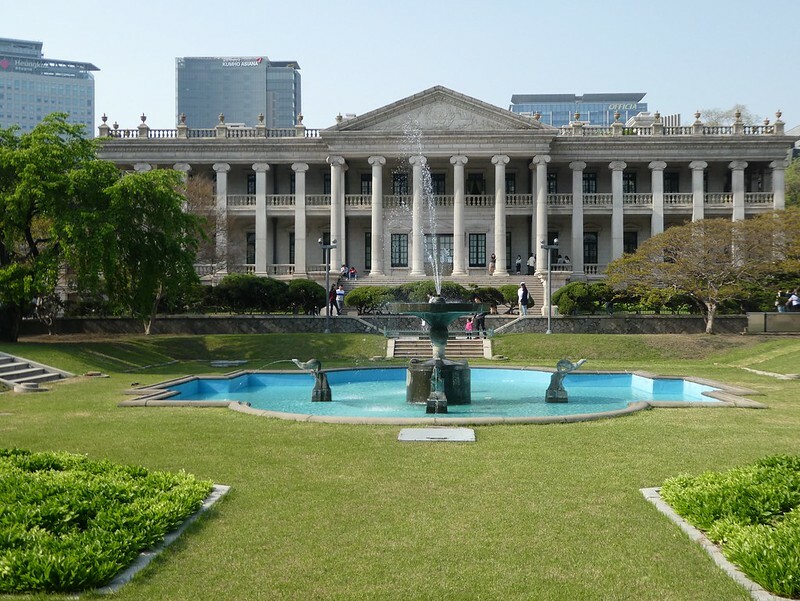 The former city hall is now the main library in Seoul symbolising the historical heritage of the city. Visitors are welcome to enter the building and in addition to general library material we were able to explore the former Mayor’s office. This has been restored to include original furnishings and other memorabilia with access to its associated reception rooms. Before leaving the building we took the lift to the top floor to take in the views from its rooftop garden. Here we found a glass walled cafe with very reasonably priced drinks, outdoor seating and panoramic views across the city. 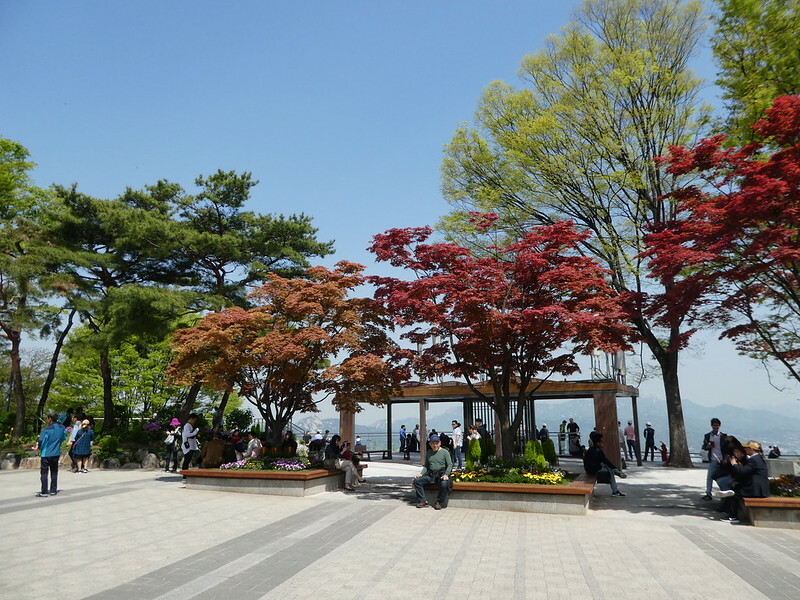 On one side we could see the lush greenery of the square below with Bukhansan Mountain peeping out in the distance. Looking in the opposite direction we had views of Namsan Tower which we had visited earlier in the day. 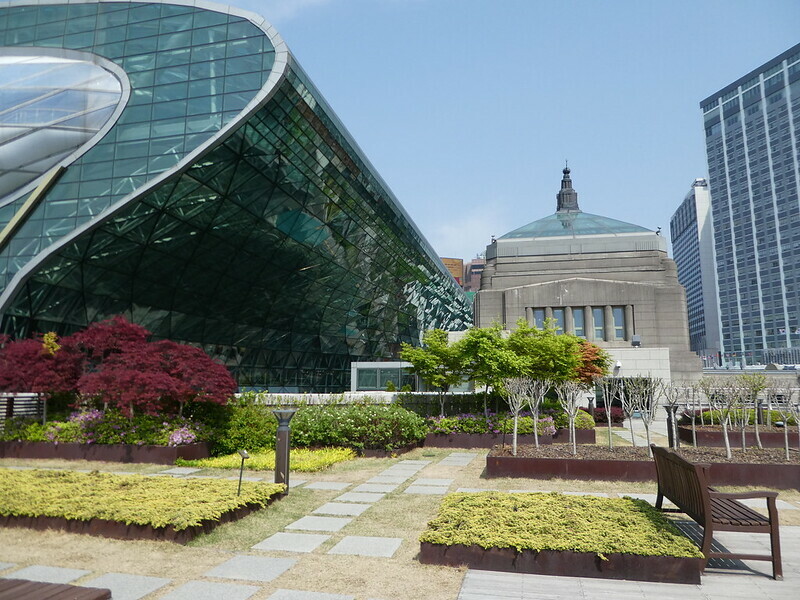 I would definitely recommend a visit to the rooftop garden as it’s a hidden gem in the heart of the city. Leaving the peace and quiet of the rooftop garden behind, we returned to ground level and walked across the square to the Daehanmun Gate. This is the entrance gateway to Deoksugung Palace and we had arrived just in time for the final guard change of the day at 3.30 p.m. The palace is located on the corner of one of Seoul’s busiest road junctions providing a complete contrast alongside modern architecture. The Royal Guard Changing Ceremony has been re-enacted in front of these gates since 1996 providing visitors with an opportunity to experience royal culture. The ceremony is held three times a day (except Monday) at 11.00 a.m., 2.00 p.m. and 3.30 p.m. and lasts for 30 minutes. The ceremony is accompanied with guards playing traditional Korean instruments and the occasional beating of a huge drum. The guards’ splendid costumes with their brilliant primary colours are a pleasure to view. 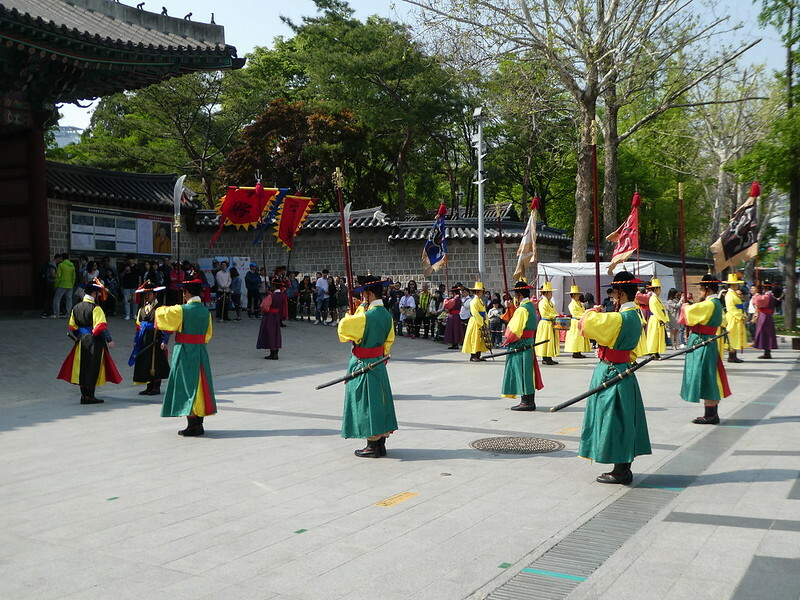 The royal guard were responsible for opening and closing the palace gates during the Joseon Dynasty. After the ceremony ended, barriers were moved to one side and people invited to come forward to have their photos taken with the guards, which I thought was a nice gesture. 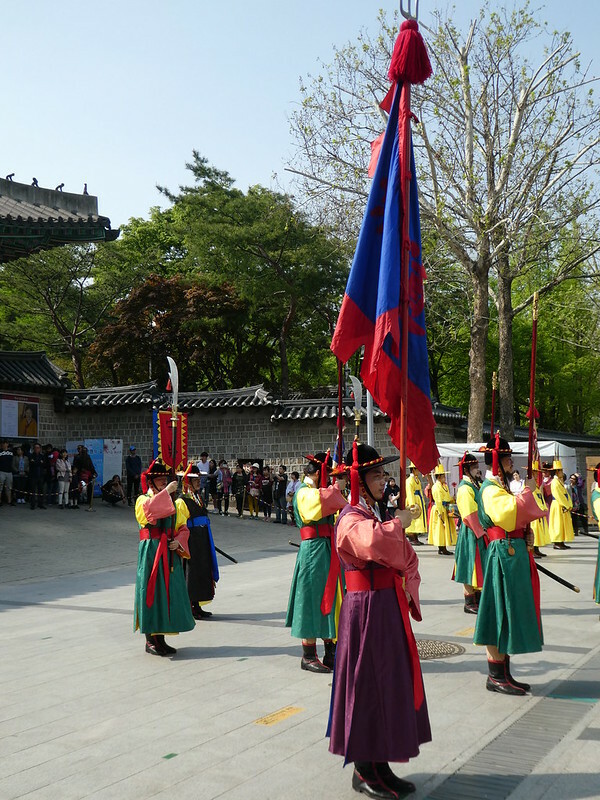 Visitors can view the guard changing ceremony free but tickets need to be obtained to enter the palace gates. As we had already purchased an integrated ticket covering all palaces and the secret garden earlier in the week (10,000 Won / £6.98) we could go straight in. I would recommend buying this ticket as it offers excellent value and the various palaces can be visited on different days. 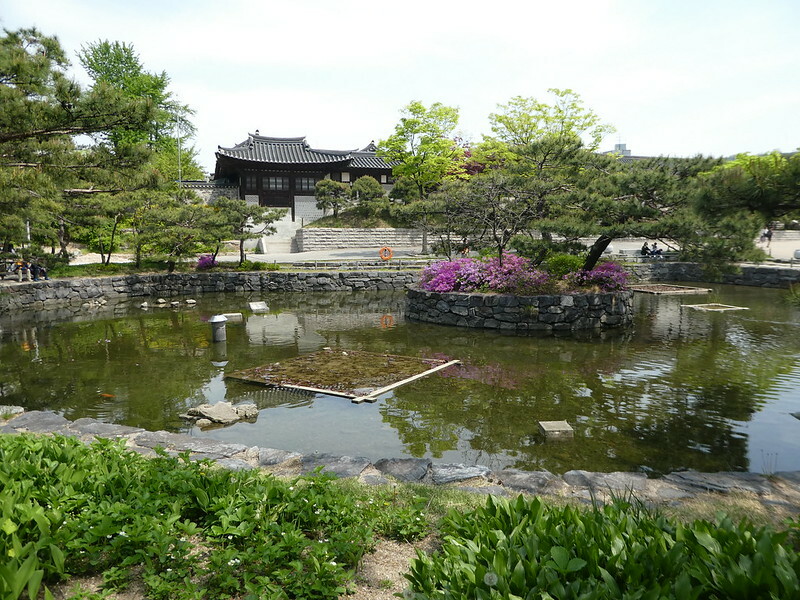 Deoksugung Palace was the second most used palace and was inhabited by members of the Korean royal family during the Joseon Dynasty until the colonial period at the start of the 20th century. The complex includes traditional palace buildings and woodland gardens. 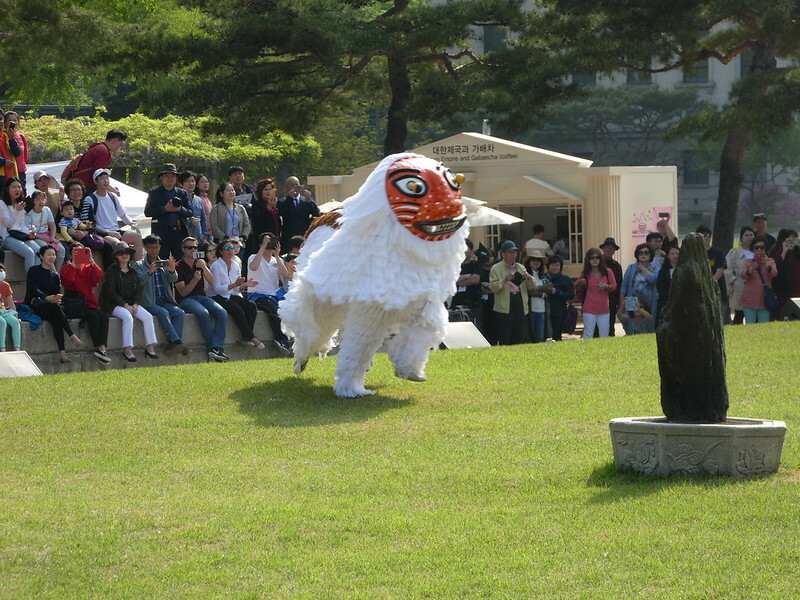 Approaching the Jeonggwanheon Pavilion we found a cultural festival taking place so we joined other spectators on the stone steps to watch some traditional Korean dancing followed by an Asian lion dance similar to the ones we have seen in the U.K. at Chinese New Year. 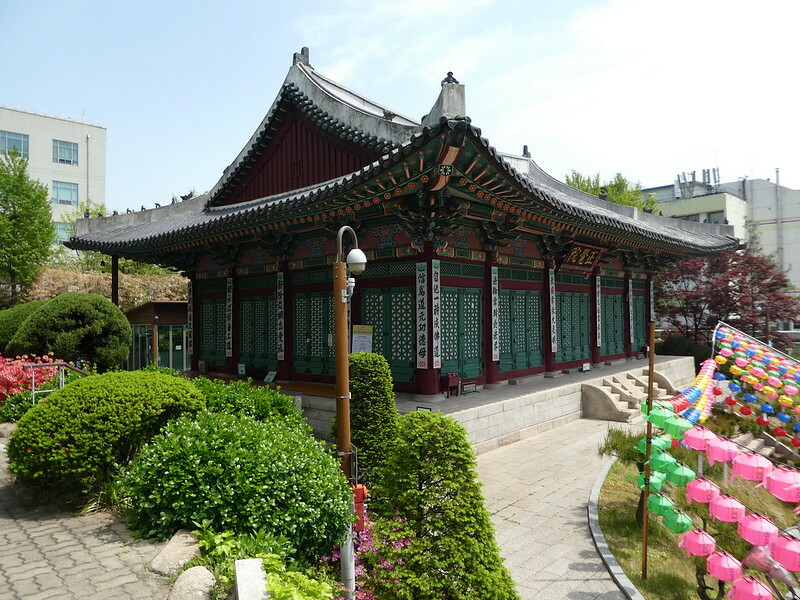 Jeonggwaheon means ‘a space to quietly view the world’ and it was to this pavilion that the king would come when he was worried about the nation’s uncertainty and would sit to consider solutions. 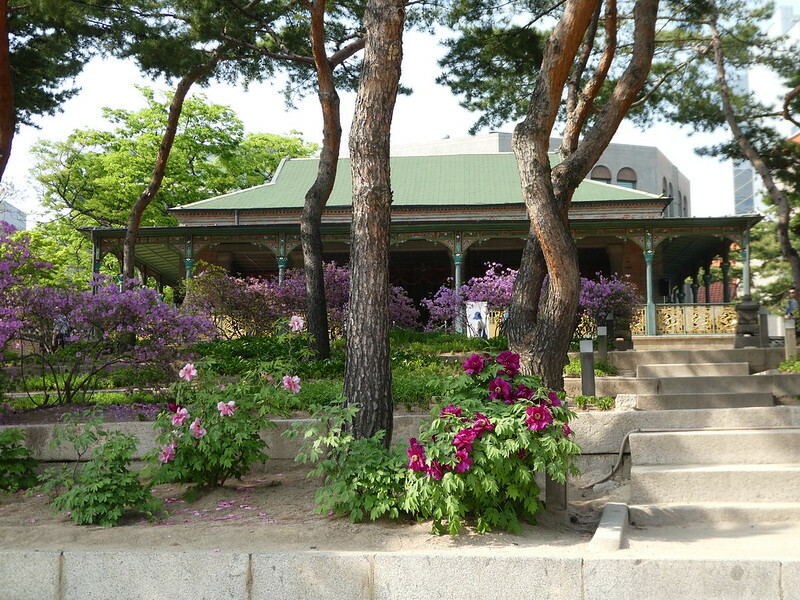 Before leaving the palace grounds we strolled around the exterior of Seokjojeon Hall which was completed during the latter period of the Joseon realm in neo-classical western style. 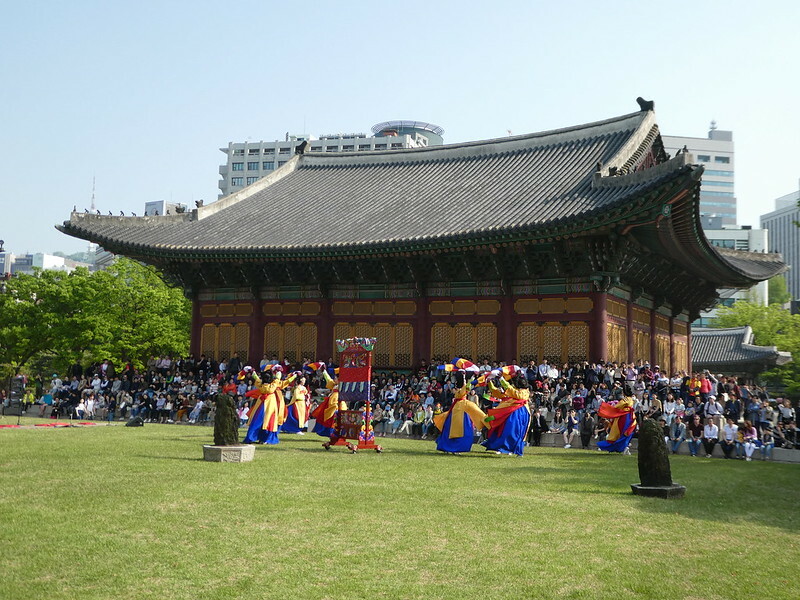 It is Korea’s first European style stone building and served as an audience hall and sleeping quarters of King Gojong. After leaving the palace we wandered down Deoksugung Doldam-gil (stone wall road) which runs down the side of the palace for 900m and is one of the most famous roads in Korea. This picturesque pedestrian footpath was once a regular road but has since been planted with 120 trees and 20 benches for people to sit and enjoy nature in the heart of the city. 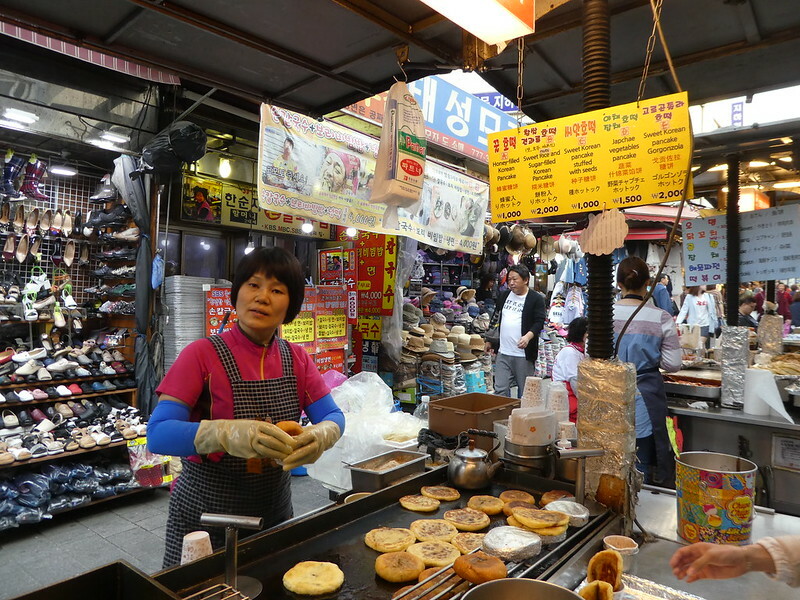 We passed several embassies in the district near the Sungnyemun Gate and called in the Namdaemun Market on our way back to the hotel for some tasty vegetable filled pancakes. By the time we returned to our hotel we were very tired but after a couple of hours rest we were feeling refreshed and ready to go out for dinner. As we’d enjoyed Chicken Galbi earlier in the week we decided to go to to the same restaurant again. There was quite a queue waiting for tables but thankfully it didn’t take long to be seated. As food is cooked at the table, diners are provided with optional aprons. As we were leaving, a girl dashed in looking slightly embarrassed as she had gone out still wearing her apron and only noticed when she had got down the road. We laughed, thinking that was the sort of thing I might have easily done! To round off our evening we walked to Myeongdong station and caught one of the circular route buses back up to the top of Namsan Mountain so we could view the illuminated tower at night and look down on all the twinkling lights over the huge city of Seoul. On such a warm, still evening it was the perfect opportunity to take in the views. The tower was illuminated in yellow and whenever we had seen it before, either from our hotel or elsewhere it had been green so we were curious to learn about the colour change. We later found out that as the tower is visible across the whole city it changes colour to denote air quality. Blue is good, green is moderate, yellow is unhealthy and red is very unhealthy. I didn’t think the air was too bad though as we hadn’t noticed any problems with smog or encountered breathing difficulties. 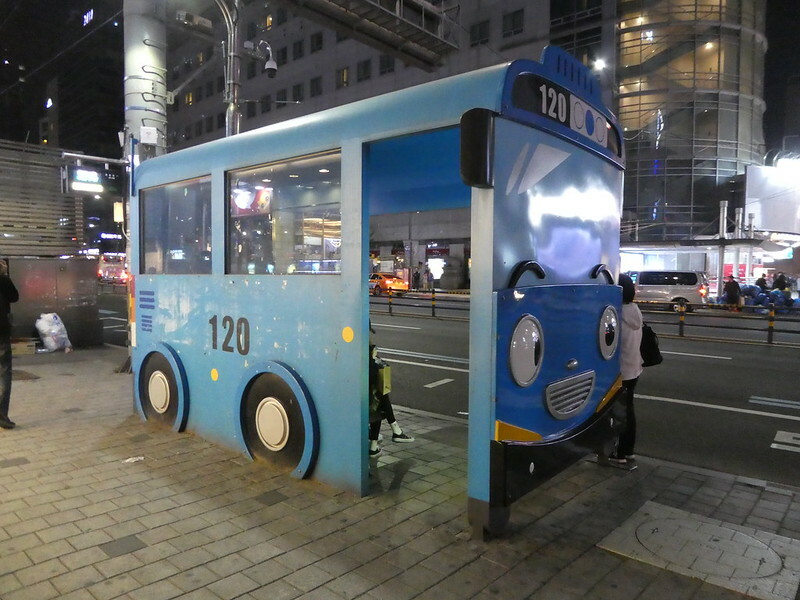 We returned back to Myeongdong by bus which runs from the tower plaza until 11.30 p.m. and after stopping off for late night coffees, it was back to our hotel for the night. 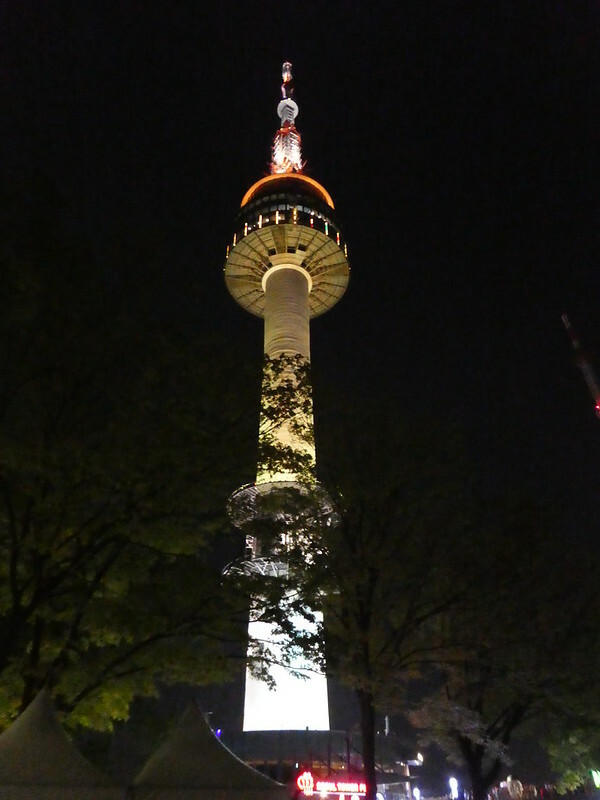 Thank you Clazz , it was beautiful around the Namsan Seoul Tower. Thank you so much for sharing these posts. What a wonderful trip this has been! Thank you Sue for your kind words. 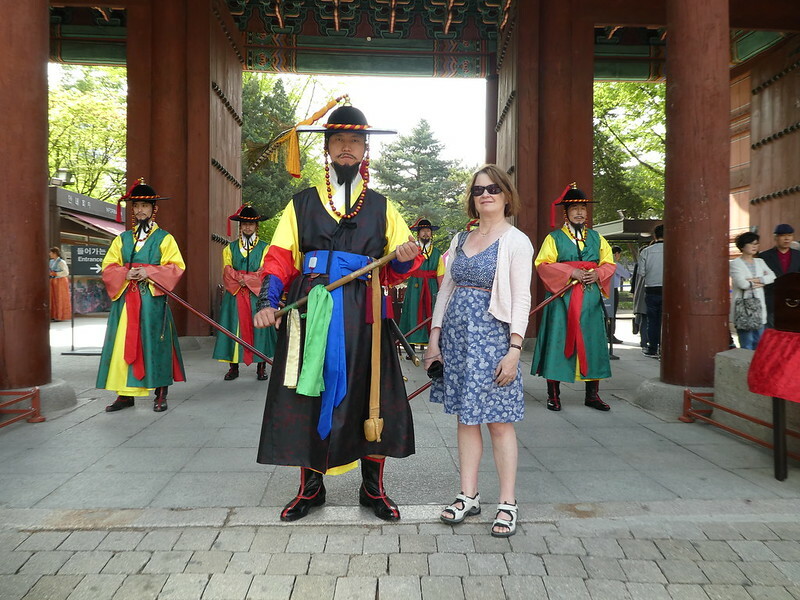 It’s so nice to hear that you are enjoying this series of posts on my recent trip to Korea. I bought cards at Insadong in one of the small shops for my grandma 🙂 they had some lovely 3D hanbok ones. It’s good that you are able to return to Seoul next month, I hope you have a good time and it’s so nice to read that you are finding my posts useful. It does feel like a magical / romantic place Ingrid. Thank you for your kind words. Wow, what is the curved glass building near the library rooftop garden? The shape of it is amazing! I learn so much from your blog. I’d love to travel to Asia now, Korean in particular. Thank you for taking the time to comment on my blog and for your positive comments. It’s so nice to read that I have inspired you to visit Korea! The curved glass building that you mention is the top of the new City Hall in Seoul. The City Hall is modern architecture we rarely see in the US. Great looking building! Thank you for your kind words and nomination, it’s so nice to read that you are enjoying my blog. I’ll follow your link and take a look at the nomination shortly. what a great day/evening Marion. Loving the colourful flowers in the park and am wishing I could eat one of those vegetable filled pancakes…yum. Excellent post. 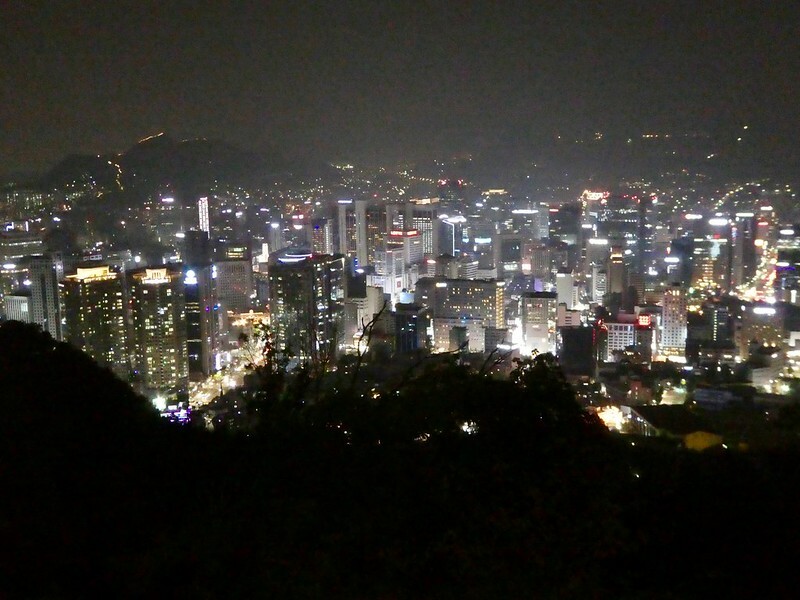 The last picture of the night time view of Seoul was especially beautiful. Thank you, it’s good to read you liked it. Nice blog. Beautiful pictures, especially the last one – the night view. Thank you for taking the time to make contact, it’s so nice to hear from you and the night view of the Namsan Seoul Tower was so nice. Always so nice to read your articles. Korea seems to be a real relaxing place with a lot of beauty. Thank you for sharing all this with us. Korea is a beautiful country and is really beautiful. Thank you so much for your kind words. We definitely need to go there as well. However maybe you also will come to China once. It is so different. I would definitely like to visit China one day! Thank you Eliza it’s so nice to read your thoughts. We loved Seoul so much and hope to return before too long! I’m certain I like Korea as much as you do Ian and hope I’ll get an opportunity to visit again sometime in the future. Thank you for your welcome thoughts. These photos are absolutely beautiful! Thank you for sharing! It’s my pleasure! I’m so pleased you enjoyed viewing them and for taking the time to write your nice comments! So many more beautiful photos and a great teaser for a Korea vacation! Thanks Marcus, I’m sure your family would enjoy a holiday in Korea and you would also find lots of interesting things to photograph! Seems to be a remarkable blend of old vs new. I love the contrast. Great post–as usual. Please keep traveling. Take care. Thank you so much for your kind words, it’s so nice to read your favourable comments! We had a wonderful time in Korea and would love to return again sometime and explore further. Thanks Allan for your welcome thoughts on my recent post. We did fit in a lot that day but didn’t feel rushed and it was so nice to be photographed with one of the colourful guards. It was an amazing visit Daisy. Thank you for taking the time to comment, it’s lovely to hear from you. What a full and interesting day you had! Love the look of that beautiful rooftop garden and the views across the city at night are stunning! We did seem to pack a lot into our day but didn’t rush around. Seoul has some beautiful attractions! Thank you for taking an interest in my posts. My pleasure! Korea certainly looks like an interesting place to visit. Thank you for your welcome thoughts, it’s so nice to read you like the photos. Thank you Jo for your much appreciated thoughts. Korea is an absolutely delightful country with its rich history, beautiful scenery and lovely people but little visited by Europeans . Hopefully I’ll be able to inspire more visitors through my series of posts. Hope you have a good weekend!